Some of the great songs of the 70's done on solo piano with amazing sound.Vivian Fields of Midnight Jazz writes : Some people have discographies, for pianist Geresti, his body of work could be called a library. Since the early '90's, Geresti has recorded and self-released one album after another,stretching his creative vision across the musical landscape. 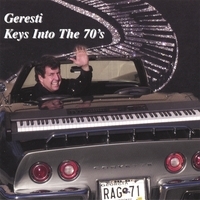 Among these is "Keys Into The 70's, wherein Geresti covers classic-rock favorites such as Styx's "Babe" and Led Zeppelin's "Stairway To Heaven", and transforms them into cinematic piano instrumentals. There is emotion in Geresti's playing, these aren't soulless paint-by-numbers makeovers for the Muzak set. Geresti is an artist, and most definitely a prolific one. Be Sure To Check Out These Links For Geresti Reviews!